Universal Orlando® is seeking male stunt performers youthful in appearance for new roles with Quarterstaff experience and able to speak with a Russian accent a plus. Audition will consist of an initial type out and a series of athletic activities. Please dress accordingly. This description falls well in line with the wizards from the Durmstrang Institute as seen in the Triwizard Tournament in Harry Potter and the Goblet of Fire. 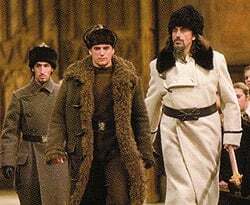 In the world of Harry Potter, it is unclear exactly where Durmstrang lies, but the accent, appearance, and demeanor of its headmaster, Igor Karkaroff, as depicted in the film certainly point to Russia. Combined with the short performance with Quarterstaffs delivered by the Durmstrang wizards as they entered the Great Hall in the movie, and the above audition call certainly sounds like Universal is casting for an act to be featured as part of the Triwizard Tournament. Moreover, the former Dueling Dragons roller coaster is being renamed to “Dragon Challenge” and is re-themed to reflect the first of the challenges that comprise the story’s Triwizard Tournament. As of yet, there is no further sign of any of the other Triwizard Tournament challenges becoming part of the Wizarding World of Harry Potter at Islands of Adventure, but it’s certainly possible that the Harry Potter and the Forbidden Journey attraction will finish the tournament by taking us into the “Black Lake” or through a giant hedge maze in search of the Goblet of Fire. We’ll find out when the Wizarding World opens on June 18.